Even as Dr. Stephen Hawking has freshly revised his theories on black holes, Disney’s The Black Hole has resurfaced on DVD and hasn’t aged a bit. The movie’s successful elements and faults all remain stubbornly intact. The Black Hole was Disney’s effort to cash in on the unprecedented bonanza of Star Wars’ success. It’s a mixed bag of fresh ambitions and copycat rehash. The crew of the Palomino, a small research team boldly going where no man has gone before, stumble upon the U.S.S. Cygnus, a ship that, until then, had been written off as lost in space. As it turns out, the Cygnus is still under the captain of Dr. Hans Reinhardt (Maximilian Schell, Deep Impact), a Nemo-like space explorer hellbent on finding other forms of life in the universe. Perched on the cusp of a black hole, Reinhardt is convinced he’s on the verge of the greatest discovery known to man. His mission is to enter the black hole, traverse through it, and see what’s out there on the other side. At his side is the intimidating robot, Maximilian, built by Reinhardt’s own hands. It’s a HAL-9000 type of machine that takes on a life of its own, the ultimate undoing of Reinhardt’s vision wherein nothing can go wrong. Avoiding the whiz-bang pace and upbeat tempo of Star Wars, The Black Hole takes a more mysterious and dramatic tone, but there are still plenty of chunks of Mickey Mouse cheese on board. In particular are all those robots: VINCENT (one of the good guys) is a floating R2-D2 rip off, the armed robots (the bad guys) are too stiff and mechanical to serve much purpose in the case of a real emergency or battle, and Maximilian is a stiff contraption that keeps his cutters spinning too long during a couple awkward scenes of high drama. In the end, the film earned a PG rating and, at the time, it was lambasted as a heresy among watchdogs attempting to preserve Disney’s tradition of making only family films. Some interesting choices were made in casting this production. Anthony Perkins, as Dr. Alex Durant, proved once again, through his nuance-free delivery, that he could not escape the stigma of Norman Bates, even if he traveled a bazillion miles into outer space to do so. Ernest Borgnine does, however, manage to shun his McHale’s Navy roots as Harry Booth, an embedded journalist on board the Palomino. Schell is the star, though, and he brings more than his share of credibility to the project, proving to be an effective heavy, psycho, and victim all in one. Mention must also be given to John Barry’s score; he concocted a creepy, spiraling main theme that ranks among his best work. But, true to form, he also used a mystery theme plucked from any one of his James Bond scores. Barry also wrote a rather generic theme for the scenes of action and heroics that, looking back on it, now seems tacked on in parts; it feels totally oblivious to the flow of the action sequences it accompanies. Then again, “the flow” of those action sequences is quite often slug-like and klutzy. For all its ideas, ambitions, and miscalculations, The Black Hole remains a big, expensive curiosity that deserves to be revisited by those looking for a bit of late-’70s nostalgia. 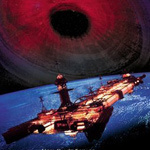 The DVD edition of The Black Hole is sparse on extras, all the more disappointing considering the release coincides with the 25th anniversary of the film’s theatrical debut. On hand are a featurette and an extended, 3-minute trailer (in pan and scan). That trailer features lots and lots of laser fire, no doubt a marketing ploy to appeal to the light saber crowd. The featurette, Through The Black Hole, is a 16-minute retrospective on the making of the film that centers around an interview with Harrison Ellenshaw, the film’s matte effects supervisor. It’s a nice, albeit brief, look back at how things were done at Disney when it was on the cusp of the digital revolution. Ellenshaw also offers some insight into the film’s conclusion; the ending used was created late in the production and its meaning is a mystery even to Ellenshaw. An earlier concept, featuring the Sistine Chapel, was ultimately scrapped, but it’s an interesting glimpse at the film’s symbolic and spiritual aims. Although technically not an “extra,” the DVD also includes the film’s overture from its original theatrical release. At the time, overtures were making a comeback as a throwback to Lawrence of Arabia and other epics, when the screen could be left dark and the audience surrounded only by the film’s theme music instead of slides, trivia, and TV commercials. That’s a great inclusion, unfortunately Disney blew it by displaying on the screen “THE BLACK HOLE: OVERTURE” during the entire run of the overture. They also failed to include a separate chapter stop for the overture; it’s included in the opening credits chapter. All things considered, the film looks remarkable in the DVD’s widescreen (2.35:1) 16x9 enhanced presentation. Some of the special effects are dated and look cheap, including some scenes on the Palomino during which the wires used to create the illusion of zero gravity are easily visible. Even so, the vast majority of the effects still create the intended illusion and there’s richness to the cinematography that stands as a testimony to the film’s lofty — and faulty — ambitions. The Dolby Digital 5.1 Surround Sound is adequate, but not sharp and pristine; the surround effects are disappointingly limited. Also on board is a French language track, also in Dolby Digital 5.1, and a Spanish language track.